SEO is now all about creating engaging content and following white hat on-page and off-page SEO techniques to rank higher in search engine result pages (SERPs). The flip side of all this is that it now takes considerable time and a whole lot of effort to get your content ranked in page 1 of Google. Because white hat tactics take time to show results, it’s tempting for bloggers and marketers to engage in black hat SEO techniques such as buying $5 backlinks from Fiverr and keyword stuffing to rise up the search ladder. Techniques such as these which were once tolerated by Google are now strictly forbidden. Here are the 7 old-school on-page SEO techniques that you should avoid at all costs to remain in Google’s good books. SEO is now more content-driven than ever. Google and other search engines value content that is engaging and useful to the user. But there were times when this was not the case. Keyword stuffing was the most common black hat technique followed by SEO professionals because it was so easy to execute and it actually worked. Use these same keywords in meta-tags as well. Google put an end to this deceitful practice in 2011 when it released the Panda algorithm update. If you use this technique now, Google and other search engines will penalize your site. 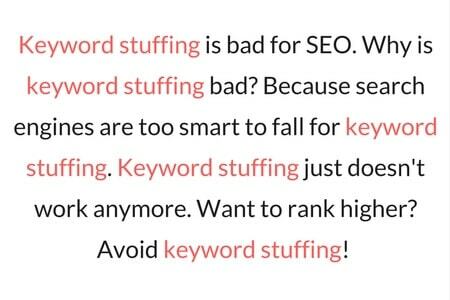 So avoid keyword stuffing like the plague. Focus on creating ever-green content that is engaging and useful to your target audience. Keyword research is still important; so use your focus keyword 2-3 times in the content and include a few relevant phrases. Avoid repeating the keywords often and if possible, target long-tail keywords. Anchor text used to be an important search signal which used to tell Google how relevant a site was. Sadly, anchor texts were misused by black hat SEO practitioners for keyword stuffing and spammy link building. Much like its predecessor Google Panda, Penguin put an end to the old-school anchor text. Now using the same anchor text over and over for internal linking will get your site penalized by Google. Be creative with your internal linking. Use different anchor texts when you’re linking to the same piece of content. And use internal linking wisely and sparingly. Cloaking is an old-school black hat technique in which the content presented to the search engine spider is different from that presented to the user. This one’s easy. Avoid cloaking at all costs. This can not just ruin your search engine rankings, but ruin your reputation as well. Site-wide footer links were once common practice. But Google observed that most of the external links were pointing to paid or irrelevant sites. Moreover, a few started stuffing the footer with hundreds of links and tags. This practice was hit hard by the Panda and Penguin algorithm updates. 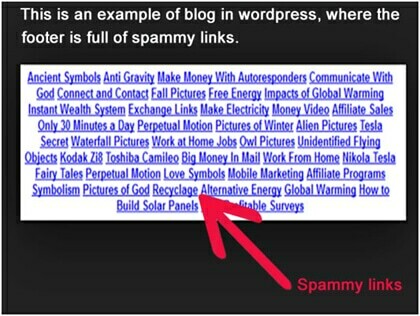 Panda targeted poor website structure and Penguin flagged sites engaging in link and tag manipulation. A footer is an important element of a website. It helps visitors navigate between multiple website sections and provides them with access to additional information such as contact details, terms of service, etc. Maintain a clean site footer which provides access to important information such as contact details, copyright info, subscription form, etc. Take a look at the footer of Moz to get a fair idea of what kind of information a site footer should contain. Despite their prevalence and popularity, ‘web 2.0’ blogs, as they are called by spammy SEO practitioners, don’t do much to boost your search engine rankings. These 2-page blogs are created on Tumblr or WordPress subdomains with a couple of articles which are then infused with links. Web 2.0 blogs are not worth the effort. Instead, focus on white hat link building techniques such as Brian Dean’s Moving Man Method or Skyscraper technique. Content swapping was a common method employed by Black Hat SEO practitioners to trick Google’s indexing protocols. While content swapping was always forbidden, even in the pre-Panda days, Google’s indexing, or reindexing in this case, was not quick enough. 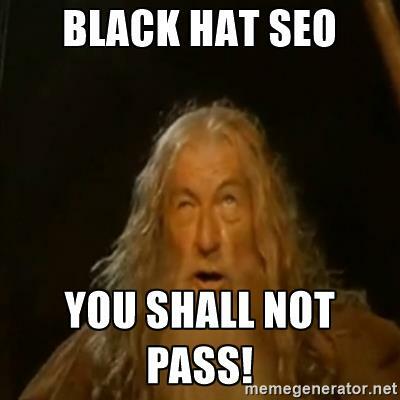 As a result, black hat SEO professionals could easily manipulate Google’s algorithms. Google’s algorithms have now evolved and can immediately cripple the ranking of any site that’s closed from indexation. Content swapping is one of the easiest ways to get penalized by Google. Create content that adds value to the topic you’re writing and stay away from this deceptive black hat SEO tactic. Links on your site should be relevant to the content you post. These links should provide additional information on the topic, making it relevant and helpful to the user. Google still values high-quality backlinks that are relevant to the site. On the other hand, inserting too many external links or links that are unrelated to your site are sure shot ways to get your site penalized by Google. These unrelated links can significantly hurt your link profile in the long run. Each time Google sees a backlink on your site, it adds it to your site’s link profile. It then analyzes your link profile to determine the search results your site should be included in. Too many irrelevant links will result in a link profile that lacks focus. Include external links in your content that are relevant to your niche and links that add value to the information you’re sharing with the users. SEO continues to evolve with Google launching one algorithm after the other. As such, SEO professionals need to keep themselves constantly updated and look for new ways to improve search engine rankings of their content. Don’t try to manipulate Google with the aforementioned techniques as recovering from a Google penalty is difficult and time-consuming. Instead, focus on white hat on-page and off-page techniques and create content that is informative, engaging, and authoritative.